Join us at the Japanese American National Museum on Saturday, August 15 for a fun day of carnival games, foods, crafts, and performances for the entire family! There will be free admission all day to the Museum where you can check out the Kokeshi: From Folk Art to Art Toy exhibition, make your own kokeshi creation and paper lantern, get your face painted, participate in a family-friendly taiko workshop with Kyodo Taiko, learn how to do an obon dance, and watch taiko performances by Kyodo Taiko and Progressive Taiko. Meanwhile, outside on the Plaza will be carnival-style games, drinks booth, and a BBQ on the Courtyard fundraiser. 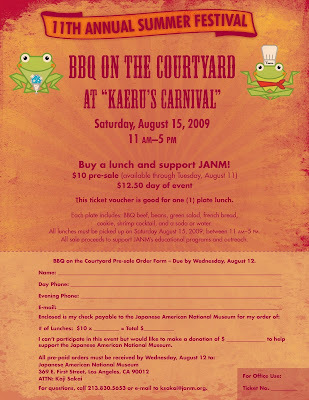 Support Museum programs and operations, plus get a great plate lunch that includes BBQ top sirloin, baked beans, green salad, French bread, cookie, shrimp cocktail, and a soda or water. Plate lunch tickets are $10 presale/$12.50 on the day of, so be sure to purchase your tickets in advance. To order, contact Koji Sakai at ksakai@janm.org. Lunches must be picked up that day between 11am-5pm. Plus, there'll be LOTS of other things going on in Little Tokyo that day for Nisei Week and the first Los Angeles Tanabata Festival will be right next to us too!